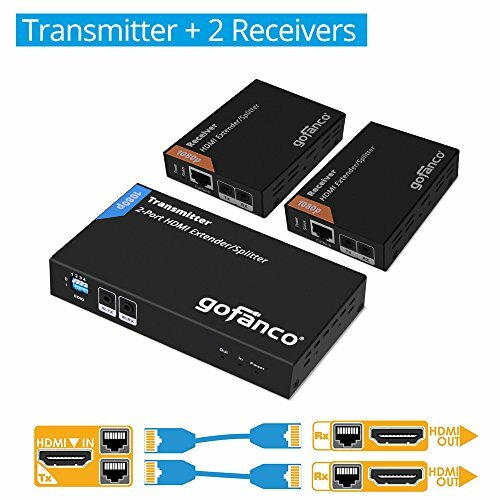 gofanco Prophecy 2-Port HDMI Extender/Splitter over CAT5e/6/7 with Loopout - 50m extends uncompressed HDMI audio/video signals over cost effective CAT5e/6/7 cabling, while maintaining signal strength and lossless video. An HDMI loopout on the Transmitter and Bi-directional IR provide convenience and flexibility to your installation. ✔ EASY INSTALLATION - No driver required; Surface mountable metal housing allows easy placement; Sturdy metal enclosure provides durability and minimizes EMI/RFI noise interference. FCC, CE & RoHS compliant. Our products are backed with a 1-year limited warranty and experienced tech support team in Silicon Valley. If you have any questions or concerns, please do not hesitate to contact us directly by clicking "gofanco" after "Sold by" then clicking "Ask a question"